SOUTHINGTON - Even as the heat beat down on the turf field, the Southington football team couldn’t contain its excitement. After a longer-than-usual offseason, one that saw the Blue Knights miss the postseason for the first time since 2011, Week 1 couldn’t have come fast enough. Southington’s quest to get back to another Class LL state title game officially begins tonight. On the field, however, it hasn’t been much of a rivalry as of late. The Tomahawks did not provide much of a challenge a season ago in which the Blue Knights won 34-7. The year before in 2016, Southington won 35-0. Glastonbury, though, will look to bounce back after a 3-7 season in 2017. The Tomahawks return a large majority of their starters from a year ago, especially on offense. Drew Daniels, the head coach’s son, is back for his third season under center and will have three offensive linemen returning. Southington will also have to keep an eye on running back Matthew Tenney, considering the Tomahawks’ affinity for running the football, as well as a trio of receivers in Andries Ramirez, Freddie Thomas and Brandon Valdez. Tight end Peter Morrisroe is also expected to be a factor. Overall, it could pose an interesting test for a Blue Knights defense that allowed 13.3 points per game last season and is replacing eight starters, including its entire linebacking corps and three quarters of its secondary. Offensively, Southington will have to contend with a Glastonbury defense that likes to bring pressure, which will be an important test for Drena who will be making his first varsity start at quarterback. He attempted eight passes last season and also saw time at receiver and tight end. Blue Knights head coach Mike Drury believes his new quarterback is more than ready for challenge, especially with all the work Drena put into the offseason to get back into the quarterback role. 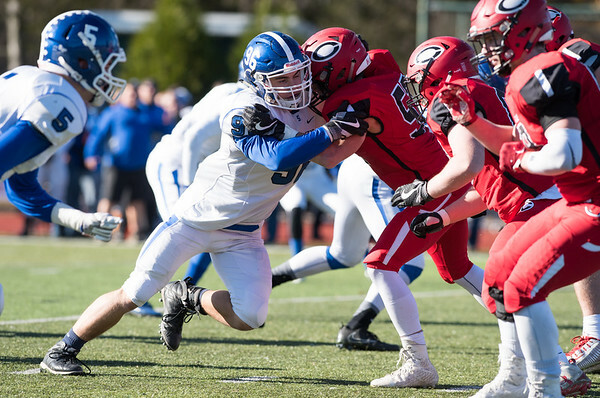 Of course, Southington knows it will come down to how well it is able to execute its game plan and play what it likes to call its brand of football. But that doesn’t mean the Blue Knights aren’t heading into the season confident. “I think we expect to put up points on offense and not allow many points on defense and do what we do every year and beat them,” Drena said. Posted in New Britain Herald, Southington on Thursday, 6 September 2018 21:29. Updated: Thursday, 6 September 2018 21:31.